A four-door Mercedes-Benz A-Class Saloon is set to hit showrooms in early 2019, and these are the first official images of the new car. Rivals for the booted A-Class are few and far between as mainstream manufacturers have largely deserted this segment of the market. Alternatives include the Audi A3 Saloon, the yet-to-be-announced BMW 1 Series Saloon and, slightly downmarket, the stylish Mazda 3 Fastback. Even the semi-premium Volkswagen Jetta is no longer sold in the UK. The new A-Class Saloon is 4,549mm long, 1,796mm wide (without door mirrors) and 1,446mm tall, which means it's slightly longer and lower than the A3 Saloon, and exactly the same width. 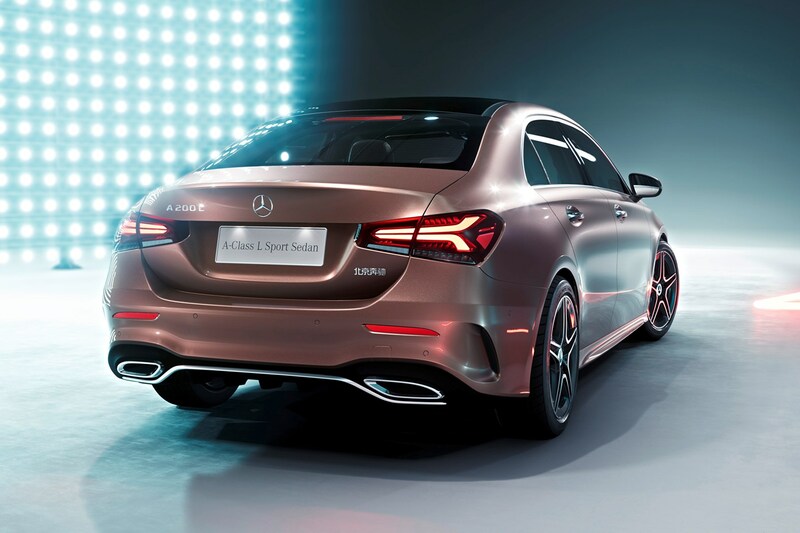 Our sources indicate that the A-Class Saloon won’t replace the outgoing Mercedes-Benz CLA – instead, the replacement for the four-door coupe range will be even sleeker and feel sportier to drive. 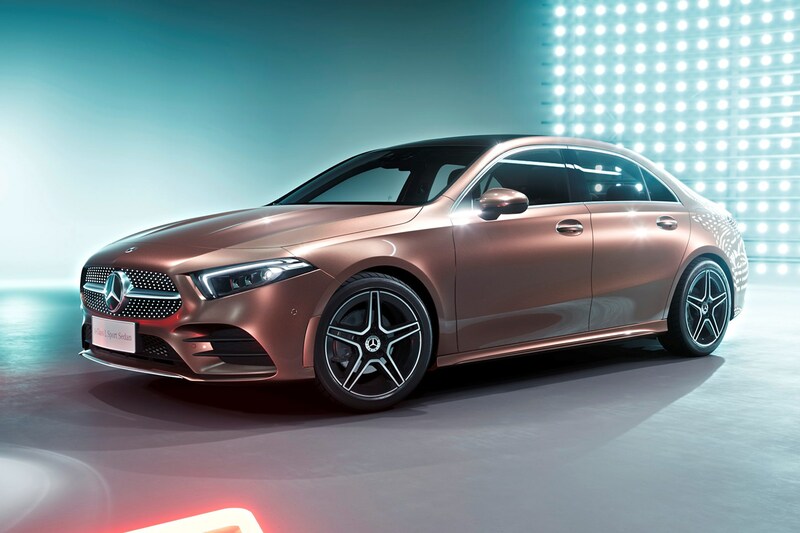 That leaves space for the A-Class Saloon, which will appeal to more traditional buyers, although it’s nevertheless a handsome creation, styled within Mercedes’ ‘Sensual Purity’ ethos. 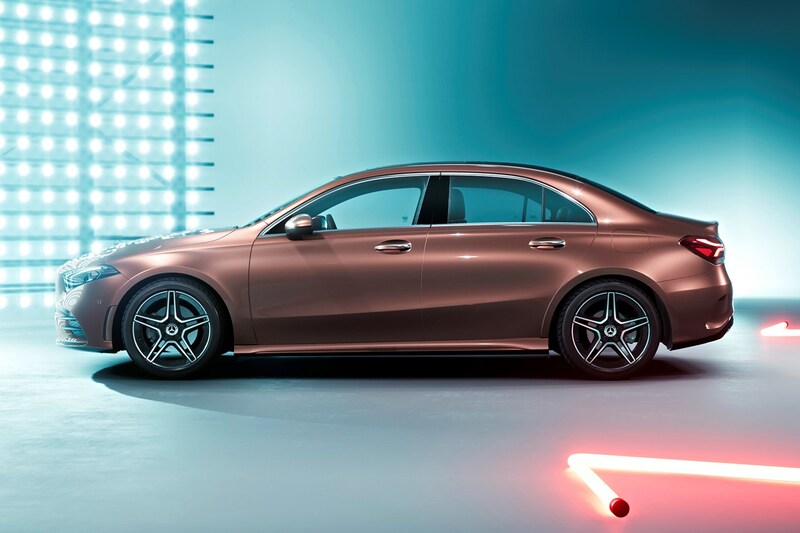 The German firm also claims to have maximised the Saloon’s interior space, so it has very short front and rear overhangs in relation to its length. Unsurprisingly, it's very closely related to the A-Class Hatchback, so you get the same low bonnet, shallow headlamps with chrome elements, and torch-like daytime driving lights. 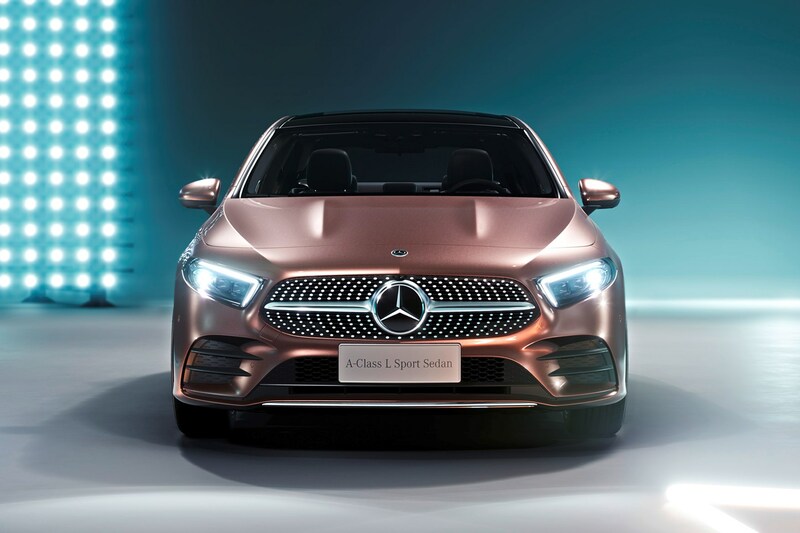 Considering it will be predominantly front-wheel drive – 4Matic four-wheel drive versions are under consideration for Britain – it has a pleasingly long bonnet for such a compact four-door, and looks very much like a shrunken C-Class Saloon as a consequence. This could tempt would-be C-Class buyers to downsize. The second model in the fourth-generation A-Class line-up to be revealed continues the company's policy of making the latest technology available to a wider audience. So it gets a raft of driving assistance systems and the latest MBUX infotainment set-up, which includes the new natural speech recognition system. You get the same S-Class-emulating dashboard and interior, which currently places the A-Class Hatchback at the top of the compact premium market. The feeling of interior space is amplified by the low-line dashboard, and the wide, landscape-format digital instrumentation. The European version of the A-Class Saloon won’t be as generous in terms of rear-seat accommodation as its Chinese-market counterpart, but there shouldn’t be much change to the 420-litre boot capacity. Mercedes-Benz is also making great play of its WeChatMyCar app that's included. The company says that it possible for two or more users to connect simultaneously to the system. The intelligent voice control works in a similarly intuitive way to home-based systems such as Google Home and Amazon's Alexa. Mercedes-Benz A-Class Saloon: how safe is it and what engines will it have? 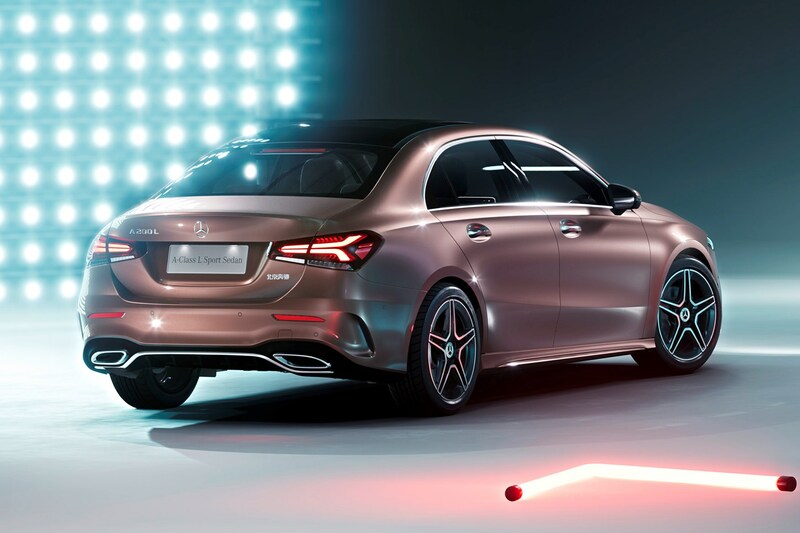 The Chinese-market A-Class L Saloon also boasts the very latest driver-assistance systems, such as the brilliant Distronic Plus adaptive cruise control system. The company says it offers the highest level of active safety features in this class. It’s safe to assume that similarly high levels of safety kit will be available on European versions, too. The engines upon launch will be the A 200 petrol with 163hp and 250Nm of torque, or the A 180 d, which is a diesel with 116hp and 260Nm. Both will be available with a seven-speed dual-clutch gearbox as standard. There's no word on a fast Mercedes-AMG version at this point. We expect order books to open before the end of 2018, before deliveries begin early the following year.